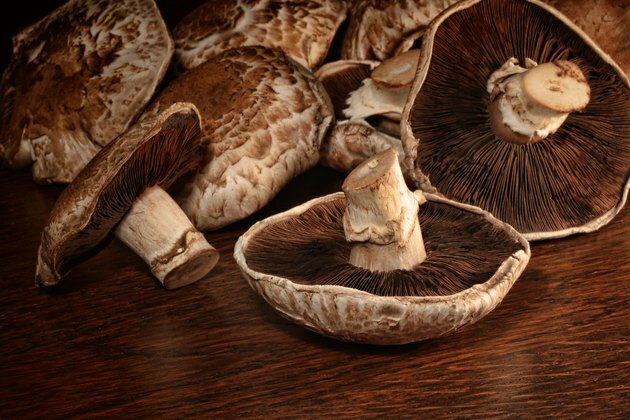 Portobello mushrooms stand out from all the other mushrooms in the produce section, with their large, tan to brown cap, dark underside and thick white stem. They're related to the common button mushroom, yet have a taste and texture all their own, which makes them more versatile in the kitchen. Portobellos are fat-free and very low in calories. They're also a rich source of selenium, copper and niacin. Portobello, or portabella, mushrooms are the mature form of baby crimini mushrooms. They grow up to 6 inches in diameter and possess a flat cap with a dense, meaty texture. Mushrooms are one of the few natural sources of vitamin D, but the amount they contain depends on their exposure to ultraviolet light. Most portobellos only have a small amount, but some producers significantly boost the vitamin D by treating them with ultraviolet light, according to the U.S. Department of Agriculture. One cup of diced portobello, which equals about one mushroom, has 19 calories, 2 grams of protein and 3 grams of total carbohydrates. Portobello mushrooms are rich sources of copper and selenium. Your body needs copper to form connective tissue, metabolize iron, and to produce energy and antioxidants. Selenium has two primary jobs to fill: It helps produce thyroid hormones and antioxidants. It also supports your health by regulating your immune system and inflammation, according to a review published in the April 2012 issue of "Antioxidants & Redox Signaling." One cup of diced portobello mushrooms contains 16 micrograms of selenium and 0.25 milligrams of copper. These values represent 28 percent of the recommended dietary allowance for both minerals. Your body doesn't store niacin or vitamin B-6, so it's essential to get a regular supply through your diet. Niacin helps metabolize food into energy and also synthesizes fatty acids. The Office of Dietary Supplements describes vitamin B-6 as extremely versatile because it's involved in more than 100 chemical actions throughout your body. It helps metabolize amino acids, produces neurotransmitters and supports your immune system. One cup of diced portobello mushrooms contains 0.13 milligrams, or 10 percent of your recommended dietary allowance for vitamin B6. The same portion supplies 3.87 milligrams of niacin, which is 24 percent of your RDA. Store portobello mushrooms in the refrigerator and use them within 7 to 10 days. Clean them with a damp cloth or paper towel. Don't rinse them because they'll absorb too much water. You can use portobello mushrooms in place of any other type of mushroom you usually enjoy, but they're substantial enough to be the centerpiece of a dish. Try using them as a meat substitute: Grill or broil them and serve them like a hamburger. Cook portobellos with other veggies, such as green beans and sweet peppers, and serve them as a side dish or in a pita sandwich with a drizzle of olive oil and vinegar. University of Kentucky Cooperative Extension Service: More Mushrooms, Please!